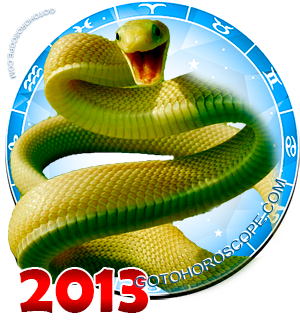 Aries 2013 is going to be a growth inducing year of Snake indeed. You will learn the value of expressing yourself through involvement with community. This will teach you the art of compromise, and the wisdom of teams. These lessons do not come easily for your fiery character. You want what you want and you want it now. This 2013 year of Snake will help you to soften and slow down a little. There is much focus on the home and family as well. Perhaps 2013 is the year to finally decide to add a baby, or find the perfect home and cohabitate. All these activities will show you the importance of others in your personal life- someone you love to come home to may not be an adventure, but it is a blessing. This year opens doors. 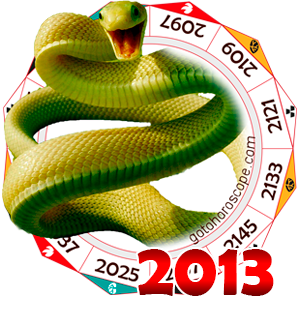 In Aries 2013 horoscope the planet Pluto is a major force for change in your life this 2013 year of the black Snake. Pluto is the planet we look to for our Souls growth potential. Wherever Pluto transits our chart we can expect deep necessary change. If we are resistant to fundamental changes, changes are made for us: You get dumped, fired or unfairly accused. Things you don't consciously choose occur. You are left with the aftermath and this is where you learn to stretch your wings. You learn what you are made of when you are forced to perform. Pluto is ultimately there to keep you on your path, squeeze you through the birth canal so to speak, it births you into a new life throughout your life. Resistance is futile. Your cooperation though, will be well rewarded. So dive into the changes with faith and a solid intention: I am open and willing to change! is a helpful mantra if you come up against resistance. With Pluto opposition the Moon you may find your feelings becoming rather acute. Your sensors are turned up high right now and you will be feeling everything. Knowing what someone is feeling and thinking are common ground this 2013 year. 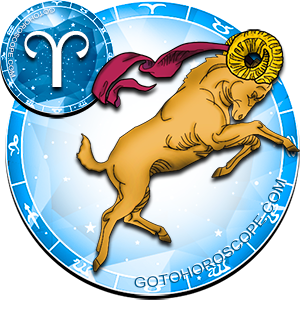 You may find this intense awareness of others disorientating as being an Aries keeps you focused mostly on the man in the mirror. Intuiting so much information can seem like overload and you will need to develop coping mechanisms to handle the energy. Ignorance is really bliss, but you are not in the dark any more. Take up boxing or sculpting metal. Also in Aries 2013 horoscope there are some challenging aspects from Pluto to Uranus and Mars. Uranus is the planet of the genius change maker and sudden events, and Mars is your ruling planet- Courageous god of war. We look to Mars in the birth chart to see how a person initiates things in the world. Aries is a natural starter. Interestingly, this 2013 year of the Snake you have a square between what Pluto is trying to do in your world and how you are reacting. These new developments, most likely including others, are going against your grain somehow, causing friction, and tension within your personality. You may find an urge to rebel alongside a desire to become a part of something. This inner tension needs to be monitored closely, an outlet for your frustration and anger should be well in place before this 2013 year begins. Aries goto emotion is often anger. It is easier to be angry than to be sad, or lonely, or confused- whatever emotion you deem week and pathetic you will try to hide under anger. This natural coping behavior just serves to suppress feelings that need to be felt. You can't let go of something until you really sit with it, feel your feelings, the real ones, under the anger. Otherwise, watch for accidents and even possible fires as the suppressed energy looks for release. If we all learned to express our real feelings there would be no reason for accidents. In Aries 2013 horoscope there is a nice trine between Saturn and Neptune. This mixed with Mercury turns our attention to communications. Dreams could likely become true this 2013 year. Perhaps there is writing you've been meaning to do, or poetry that needs writing. Your creativity could lead you to all you've dreamed of. You have the sober stable influence of Saturn to stay the course. Success is not a random blessing, rather what happens after risk and failure. Be careful not to waste this influence in the haze of some nasty addiction. This is the energy that allows you to pull ahead, to let go of the destructive urges and choose well and right. Two thousand thirteen can be all that you make it with just a little intention and focus- two qualities that you are gifted with this 2013 year of the black Snake. If I ever had the chance to turn the time back into 2013, I really would've graduated High School so I would've find myself a great job for me to work with to save all of that money for where I would've gone to have planned for my future out there! !